At first, I told them no. I know how much work goes into preparing for filming a show for My Craft Channel. There's also a lot of time spent on the production side of the shows and since this show is based on Pinterest there would need to be a lot of coordination with the team to explain the PINS and give credit to the original source. But apparently every time I talked to someone about this my enthusiasm for the idea got the best of me and everyone noticed. So after some gentle nudging I finally agreed to host this show. I've already filmed the first four episodes and the first begins airing on this Thursday 1/12/2012 (which by the way, 12 is my lucky number). 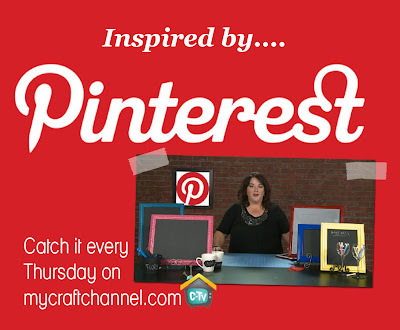 So be sure to check out My Craft Channel this Thursday and (everyday) for wonderful inspiration. The show is called "Inspired by Pinterest." If you don't know what Pinterest is all about, here's a blog post I wrote explaining this wonderfully addictive website..."Are You a Pinhead?" Great idea, Lori. I can't wait to tune in! I LOVE it! Way to go you!!! Super idea! Your creative ideas amaze me. Sounds like a great idea, can't wait to see it!! I'm so proud of you Lori! You will do great! If you need any help I am here for you. I love this. One of my goals this year is to actually DO something with all those pins. Looking forward to Thursday. Yay Lori!!! How exciting! You'll be great!